As Immigration Crisis Grows, A Protest Movement Gains Steam Several hundred protests will begin Friday in cities across the country, as activists rail against the Obama administration's efforts to temporarily house migrant children detained at the border. In Oracle, Ariz., on Tuesday, protesters gather near the entrance to a juvenile facility in an effort to stop the arrival of a busload of Central American immigrant children. The bus never arrived. Anti-illegal immigration activists are planning several hundred protests in cities across the country on Friday and Saturday, part of a growing backlash against the federal government's efforts to temporarily house migrant children detained at the border. Protesters say they are concerned about safety, as the Obama administration pushes to move detainees from Texas to shelters run by nonprofits in other states. 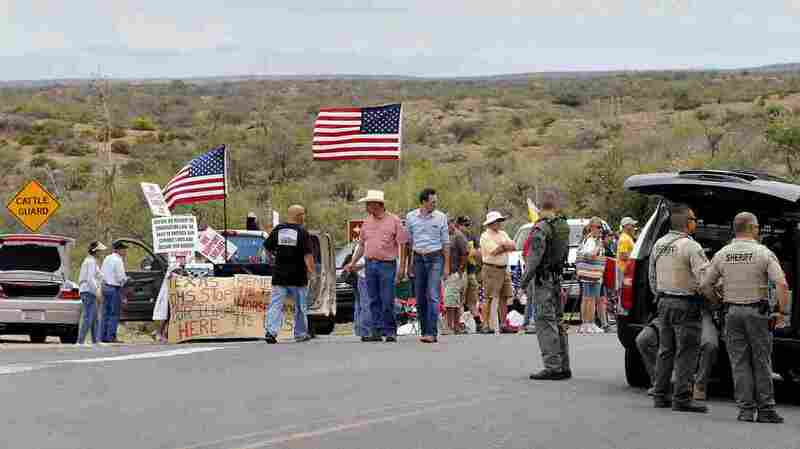 This week outside the southern Arizona town of Oracle, Marla and Bruce Bemis — along with several dozen of their neighbors — were lined up along a road waving American flags and holding signs, as patriotic music occasionally played in the background. Word had come that the federal government was planning to bring some of the detainees to a local academy for troubled youth. "You know it's a shame that they're kids, if they're kids, but I guess their parents didn't care that much to send them on that journey to here," says Marla Bemis. 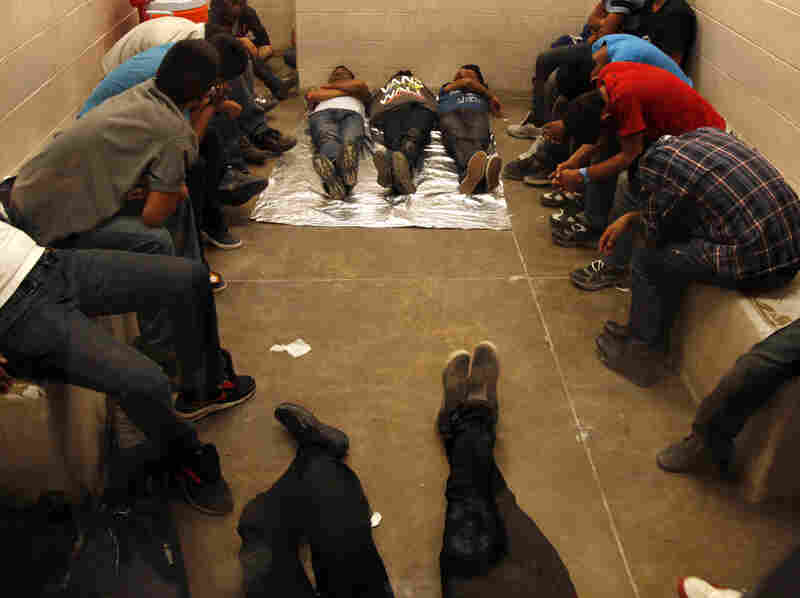 Immigrants who have been detained while crossing the border are held inside the McAllen Border Patrol Station in Texas this week. There's often an undercurrent of suspicion at protests like these. 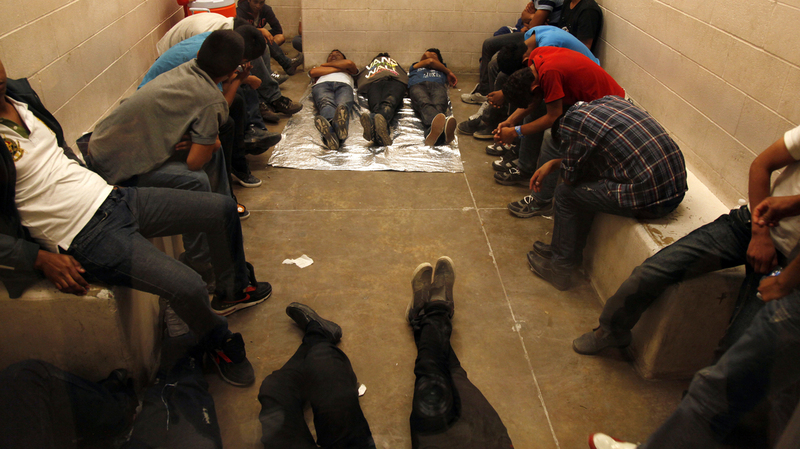 Most of the asylum seekers crossing the Texas border are kids without criminal backgrounds. Nevertheless, the Oracle protesters pledged to stand in the road to stop the buses, just as others did earlier this month in Murrieta, Calif. In Oracle, the buses didn't turn up. One of the organizers of this movement against the government's plans is William Gheen, president of the North Carolina-based Americans for Legal Immigration PAC. "We're the good guys and gals in this equation," says Gheen. "We're the American defenders that are standing with the current Constitution, the existing federal laws, and the current borders of the United States that are in peril here." Gheen says protesters are relying on "whistleblowers" — people who work for federal agencies who have learned where the detainees are being sent. Social media are also playing a big role in planning for the two days of nationwide protests that begin Friday, ranging from demonstrations in front of Mexican consulates in California and Arkansas to waving flags on highway overpasses in North Carolina. "Then in November, we're going to throw so many illegal immigration or immigration reform amnesty supporters out of office, mostly Democrats, it'll make your head spin," Gheen says. While there's a clear, larger political agenda at play, many protests are also being fueled by a resurgence in anti-federal-government sentiment noticeable in some parts of the country. Still, not all of the opposition is coming from conservatives. A bipartisan group of governors has expressed concerns about costs to states, the health of the children who are arriving, and whether Congress and the president will come up with a long-term plan. And then you have local officials, some of whom say the federal government and its lack of communication aren't helping the situation. Jeff Stone is chairman of the county commission in Riverside County, Calif., a large, suburban county east of Los Angeles. Murrieta is in the county, and Stone, a conservative Republican, is one of the local leaders who inspired the protests there. "We still don't have communication from Border Patrol, whether there's going to be immigrants coming or not coming," he says. "We don't have any communication with ICE. So it's just been very disorganized." Stone says his county was prepared to handle a couple of hundred migrants — any more than that would put a strain on local governments that are already struggling to provide services for residents. "Listen, you can't blame these immigrants for trying to take their children and go someplace where they're not oppressed and not threatened by gangs and that such," he says. "You certainly cannot blame them for wanting to find a better life in this country."